The Guide to Get Rich: Your Local Savings Account Isn't Working! Your Local Savings Account Isn't Working! 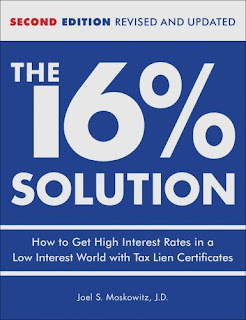 This book is one that I have wanted to read for some time and found it at Barnes and Noble last week, it's called The 16% Solution by Joel S. Moskowitz. It is all about getting high interest rates (averaging nationally at 16%) by investing in tax lien certificates. It is a whole lot more fun than it sounds, trust me. A tax lien is when a person doesn't pay their property tax. Some states have taken those tax liens and have started to sell them to private investors. If someone doesn't pay their taxes there is big penalty of 8%-30% added on to what they owe. When governments opened these up to private investors they come with the penalty percentage too. So if an investor buys up base amount of the tax lien, and all the penalty will be their return. These states have basically created a win-win situation. They need their tax money so they can provide services and fix the roads and investors want a big return on their investments. Moskowitz explains that we live in a low interest world and it's very true. I just opened up an account with a new bank the other day and asked my banker, out of curiosity, what they were offering on savings accounts. He told me they were offering a third of a percent. Whoa! That is incredibly low. Now, I know a lot of people are going to through this idea out because they think its too "risky." The truth is, it's really not. This is a tax lien put on by the government... have you ever known the government not to get what is owed to them? Well that same security of payment is transferred to you when you buy this certificate. And then the second argument... What if the defaulter decides not to pay? Well if they actually do decide not to pay... you get the property in most states. Which is an incredible deal. Property taxes are at most 5% of the value of the property, if they don't pay you get the whole thing. That is a huge return on investment! Which is why most people pay off the tax lien to begin with, they don't want to lose their property. But on your end, you have to make sure the property is something they will want to keep. Moskowitz advises everyone to do their due diligence. Don't just go into the tax lien auction buying up everything because you could get burned in the short run. He gave a couple of examples of people getting burned that really stuck with me. In the first example he said someone bought up old industrial tax lien property. Well in that case the defaulter didn't pay the lien and the individual ended up with the property. And then found out that the property was polluted and needed to have industrial cleaning done to it, which meant thousands of dollars in cleanup fees he was obligated to pay. The second example was from a person who bought up a bunch of liens and again ended up with the property to find out it was zoned as open space and it was in the middle of nowhere. Good luck on the reselling of that land. This is why you have to do your research, become friends with the county clerk (they will know what is a good area/ bad area) and actually go to the property you intend on buying the lien certificate for. All it takes in most cases is a drive by to confirm it's a decent piece of land. Moskowitz recommends residential properties because they are the safest way to ensure someone will pay the lien and if they don't you have a house, which is easy to resell. A lot of my readers are from Missouri, so I will mention that Missouri does have tax lien certificates for sale in 114 counties with a 10% return. If it's in your county, you already know the area so you are way ahead of the game. And making 10% on your investment sure beats that 1/3% your local savings account is providing. There is a lot of "how-to" in this book, way more for me to cover in this blog. But I definitely recommend it. I read the whole book the night I bought it because it was written so well and it got me really excited to try it out. There are tax liens of every size/ amount, so you can go to an tax lien auction and leave with at least one... and it's definitely worth a try in my opinion. It is a lot more fun than mutual fund investing because you have the carrot of potentially getting property out of the deal. If you have any questions on the book don't hesitate to ask. I would be more than happy to help anyone that needs it. I heard robert kiyosaki talking about this in one of his books a while ago. Thanks for the basics of it. Definitely interesting. How To Get a Job... Even in This Economy!